After the Soviet Union started their invasion of Finland on 30.11.1939, later known as the Winter War, their strategic plan included the objective of cutting Finland in half in the north. This would effectively cut Finnish supply lines for a large portion of its geographical area, and in turn would allow Soviet Union to attack Finnish population centers from both north and east. One of the three lines that were meant to cut through northern Finland was to advance through Kemijärvi-Rovaniemi-Tornio line from the Soviet Union to the Finnish-Swedish border. This undertaking was spearheaded by the Soviet Union’s 122 rifle division, led by Colonel Peter Shevchenko. A battalion of Soviet Union’s 569th infantry regiment – part of the 122 rifle division – was tasked on 19th of December to flank the Finnish troops by bypassing the frontline via the south. The battalion’s objective was to cut the important Salla-Kemijärvi road by occupying the town of Mäntyvaara. At this point in the war, the Soviet forces were so sure of their eventual overwhelming victory, that some units already carried celebratory banners for when the Swedish border was reached and the country was cut in half. The Soviet battalion carried out a successful flanking movement, and settled to unopposed positions on the Mäntyvaara fell, overlooking the town from an advantageous position. They had settled positions, and had successfully completed their mission, and were waiting for Stalin’s birthday on the 21st of December to cut the objective road in half as a celebratory token for their leader. With hindsight, the Soviet position was strong, and they were just waiting to deal a fatal blow to Finnish logistics in the area. If the road was cut near Mäntyvaara, it would allow for the Soviet plan to unfold, and would almost certainly mean the military loss of Finnish Lapland. Everything was in place for a total Soviet victory, but on this day in Mäntyvaara, fate was to intervene. 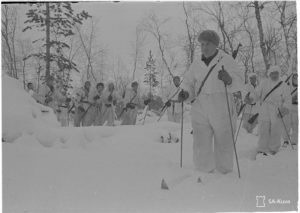 Soldiers of Lapland Group during the Winter War. Image courtesy of SA-Kuva. Finland’s Detachment Roininen – named by their commanding officer, and consisting at this point of three rifle battalions – was in active combat from the 16th to 19th of December in Joutsijärvi region, east of Mäntyvaara. The unit that engaged in this battle was Er.P.17, a rifle battalion nicknamed “Salla Battalion” consisting of three companies of infantry, and after tough fighting in Joutsijärvi, they got relieved from their position on the morning of December 20th. Their orders were to give frontline responsibility to the relieving battalion, and moving behind the frontlines to Mäntyselkä for rest and recovery. This would have put the battalion 5km west of Mäntyvaara, and left the flanking Soviet force alone in Mäntyvaara fell. This is when fate stepped in, and a small mistake changed the course of history. The Finnish courier that delivered the message to Er.P.17 misremembered the name of place – instead of instructing the battalion to move to Mäntyselkä, he accidentally told them they were to move to Mäntyvaara village area – 5km east of where they were supposed to, and right where the Soviet Battalion had reached without alerting the Finnish army, and where they were waiting to cut the main road. Historical records from Er.P.17 war diaries show that right after the battalion had moved to Mäntyvaara, there had been sightings of paths in the snow, and reports from locals of a strange group of 40 people in the area. The order came down from Regiment to immediately send small recon forces to find and identify the enemy forces. They started north from the village – right to the fell – and only a few minutes later, the first shots in a deciding battle were fired. The whole Finnish battalion quickly and decisively formed for attack, and the order was passed down to “find, engage and destroy the enemy”. The battle of Mäntyvaara was characterized by Finnish forces attacking uphill to the fell – in military terms a very undesirable path – and bloody hand-to-hand combat. Minus 15 degrees Celsius and 15 centimeters of snow, combined with the almost 24-hour darkness made for a chaotic scene. The nature of this battle is very well illustrated by Finnish soldiers patting the back of a human figure in front of them – to see if they had a small rucksack or not. Finnish soldiers dropped their packs before attack, while Soviet soldiers didn’t. If a Finnish soldier felt a pack in the darkness, that would mean they’d attack with knives and the butts of the rifles. A dark, violent, and chaotic battle ensued in the fell for hours, with Finnish forces slowly gaining ground with great resolve and successful hand to hand combat. The battle raged from midday to 6pm on the fell. At this point, Finnish forces had destroyed and routed the Soviet battalion, and driven them from Mäntyvaara. Before the battle, the Finnish scouts had estimated the enemy to be 50-100 people in strength. After the battle, enemy causalities were recorded as 250 soldiers, while the Finnish lost 17. Later on, and recorded in a mass grave monument north of the fell, the total count of dead Soviet soldiers was over 380. A miraculous result, predicated by fate and an honest mistake that played a big part in Finland achieving a defensive victory in the winter war. After the war, and to this day, historians have struggled to explain the overwhelming Finnish victory in Mäntyvaara against a stronger force in established positions, and fighting uphill. This in part is reflected in the memorial sign erected east of the site of battle in 1960, which reads “Tässä auttoi Herra” – “The Lord helped us here”. In the village of Mäntyvaara, south of the fell, there were a few pre-war houses which were used mostly by battalion HQ and service units. Before the war, one of these houses belonged to a local peasant farmer, who had both of his sons fight in the world war with distinction – his sons both received a commendation signed by Field Marshall Mannerheim himself. This house stood in the middle of one of the most decisive battles of the Winter War, and housed two distinguished soldiers. 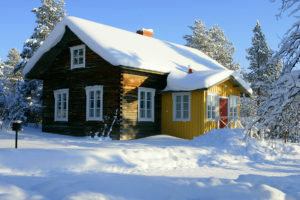 Today, this house is next to Kakslauttanen river, in Kakslauttanen Arctic Resort. 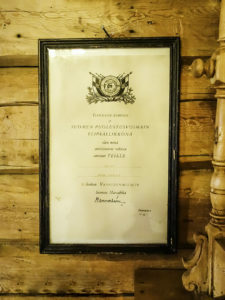 It’s called Traditional House, and on its walls you can see Mannerheim’s signature on the accommodations to the sons of this house. The whole building was moved to Kakslauttanen while there was a search for a traditional pre-war Finnish home to have on site. The buildings around this one were already beyond repair, and this house was saved just before the roof was about to collapse. 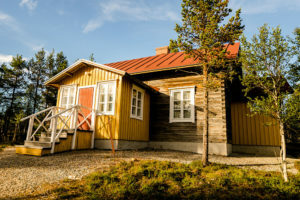 Nowadays its fully restored, and you can book it for your stay in Kakslauttanen. You can literally sleep in a house that was at the flashpoint of world history.